27 Jul 2015 in Books ~ read. About two years ago the CEO of Chrysler, an Italian-Canadian man by the name of Sergio Marchionne, came to my school to give a talk about the business and his road to greatness. Mentioning that he majored in philosophy as an undergraduate (and earning big kudos from me in the process), Sergio remarked on how this novel in particular shaped his belief system. But it wasn't until I discovered the Bokklubben World Library that I began seriously considering it. How it jumped up to the top of my reading list is a mystery. "My life was fated to be ruined because I encountered this 'venerable father' too late, when the portion of my inner self still capable of being saved was minimal." The narrator is a young writer who remains unnamed throughout the novel. Perhaps this was Kazantzakis’ (the real author) way of pointing out that he himself did not deserve to be remembered. A somewhat wealthy man of letters, the narrator spends his entire life attempting to extract divine metaphors and poetry out of everyday experiences, but in doing so loses appreciation for the phenomenological aspects – the qualia – of what make them worth experiencing in the first place. Capable of meta-analysis, he recognizes and laments this fact; you can see it reflected in the quote above. I really like self-aware authors because they craft, or should I say give birth to characters that feel genuine, and Zorba's narrator is certainly such a character. In fact he is characterized to such a degree that we know even the figures who have most influenced him - Homer, Nietzsche, and Henri Bergson. In contrast, Zorba is a true bon vivant, a tour de force of a character whose will to live and to live fully are matched by none. 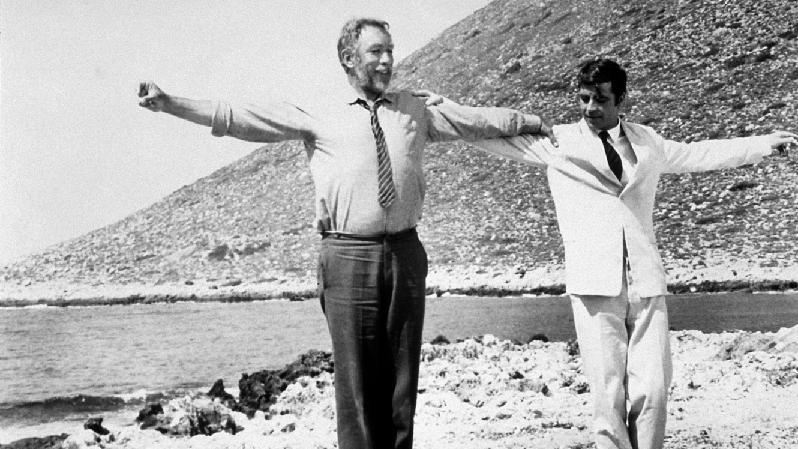 A vigorous old man, Zorba is the kind of person who spends every moment really living instead of merely pretending to. The narrator ostensibly employs Zorba to work as a foreman in a lignite mining operation, but figuratively employs him as a… shall we say, life coach. Although Zorba hasn’t read so much as a book in his life, and written even less, observing him teaches the narrator more than the thousands of tomes he’s read, more than Homer or Nietzsche ever could. By day, Zorba throws himself fully into his work; by night, he becomes a full-fledged hedon, eating, drinking, singing, womanizing, dancing. One interesting point is that the narrator spends much of the novel struggling to write a work called Buddha, a treatise on the Tibetan religion in which nirvana can only be attained by discarding all desire. Ironically, the more time he spends with Zorba, the more eager he becomes to finish the work - not because he successfully manages to discard desire, but because by finishing he can discard Buddha and what it represents. He wants to be like Zorba. In Zorba’s world, God and the Devil are the same existence, and the greatest sin of all is to repress human desire, to fail to act upon it when it calls you. Zorba is the anti-Buddha. The kinds of people who let themselves react to circumstance, who have no true control over their lives and are only human insofar as their ability to eat and talk. Deterministic reactionaries. So, we shouldn’t be like this! Peasant though Zorba is, he still understands his own character and belief system as well as any philosopher, his foil the narrator a damning projection of Kazantzakis’ old self. Buddha is wrong; Zorba is right. In the end, the lignite mine collapses spectacularly in failure, the narrator having pissed away all his money. As he and Zorba observe this, they laugh, run to the beach, and start dancing, not a care in the world. Some would call this madness, but I say it's good reason! Because, in a way, he spent the money acquiring something far more valuable: a meaningful philosophy of life. Shamefully, I admit to being pretty much the narrator for most of my life, choosing to observe others and partake vicariously in their lives instead of living out my own. I still carry some of these habits, and reading Zorba felt like a clarion call. Zorba provides a good model for happiness, and it seems like the good majority of my millenial contemporaries understand this because they structure their lives in a similar way. I don't know when, but at some point along the way I forgot how to live. Nobody could have told me this, nor could I have seen it myself given my philosophical myopia as of late; Zorba came along at a great time. Which is greater – the childlike wonder of experiencing something for the first time, or the stoic gravitas of experiencing it for the very last?